IKEBANA, the Japanese art of flower arrangement, dates back over 600 years yet is still practiced and cherished in modern-day Japan. Ikebana is about the simplicity and beauty of nature. The arrangements are artfully made with a relaxed mind and peaceful heart and aim to achieve harmony and perfect balance among the composition's elements. 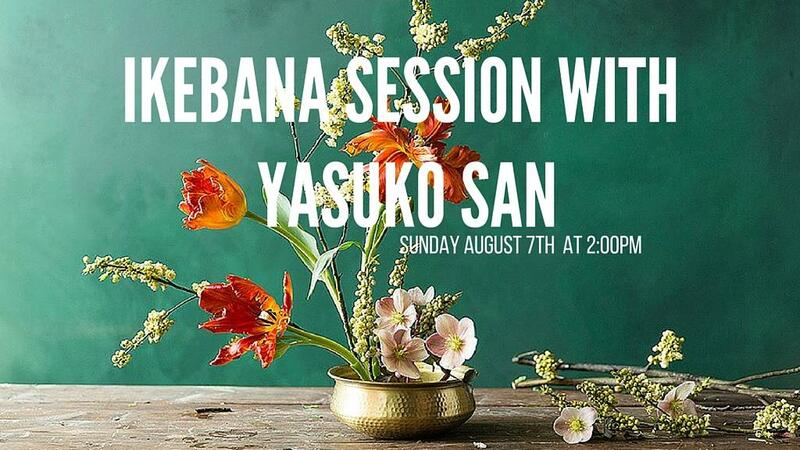 This is a hands on class led by the wonderful Ikebana teacher, Yasuko San. We will start by learning the basic form of Ikebana with seasonal greens. Then, we will create our own Ikebana that will be unique to each person's own esthetics and emotions. Please bring some of your favorite flowers and greenery (whatever catches your eye from your garden, any flowers, branches and greenery) and make sure you have different heights, textures and colors. All other materials and tools, including a specific Japanese kenzan (floral frog) are provided. Please bring a vase so you can take your arrangement home to enjoy.